My mom got me a gorgeous new titanium/cast iron pot that you can apparently cook anything in without adding oil or water and it’s non-stick. I couldn’t wait to try it out. Last night, I made a risotto – true enough, nothing stuck. Tonight, I gave it another whirl. So, with a fridge full of our biweekly local foodshare harvest, I decided to whip up something that would take full advantage of all that wonderful summer produce: a summer-kissed macaroni pasta. The great thing about this is that you can use any fresh produce you have – feel free to substitute with what you have. The only important thing are the tomatoes. 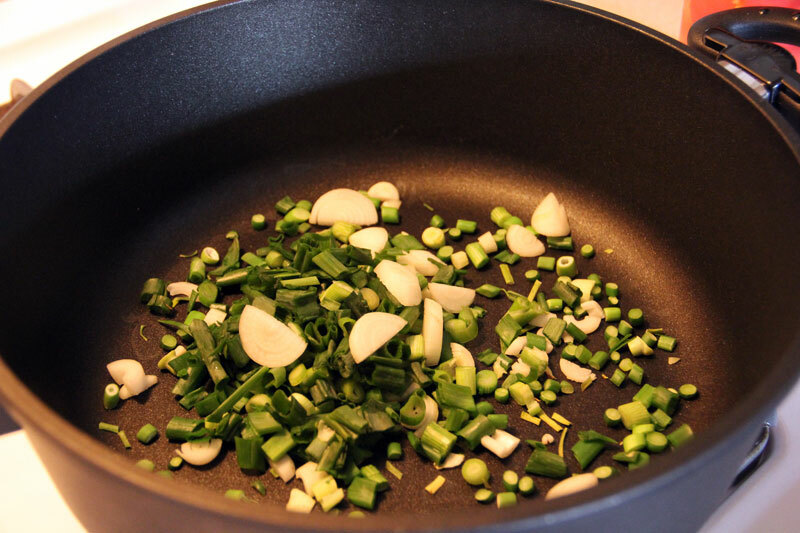 Chop up your garlic scape into fine chunks, along with your red onion and add them to the pot. Turn up the heat to medium. Coarsely chop the leeks and also add them to the pot. Let them brown slightly as they sauté. Stir occasionally, so they don’t burn. Next, chop the tomatoes, zucchini, arugula (and/or any other vegetables you are including) and add everything to the pot, except the arugula. them. To do this, get a large pot of water boiling and also a bowl of cold or iced water. Score the bottoms of all your tomatoes with an “X” and put them into the boiling water. Each should only stay for a few seconds, at which point you will need to take them out and put them into the bowl of cold water. Do this with each tomato. The peels should slip right off. If they don’t and are still sticking to the tomato, put the tomato back into the boiling water for another second or two. That should do it. 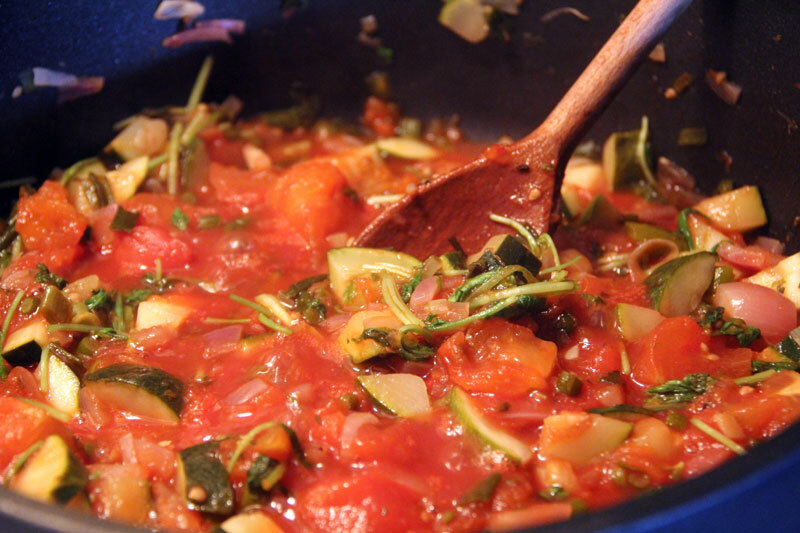 Cover the pot and let the vegetable mixture simmer for a while, checking on it occasionally and stir the mixture. After about 7 minutes, add the salt, pepper, Italian spices, chili pepper, and tomato sauce. Cover the pot again and let it continue simmering. When the vegetables have softened and are near done, add the chopped arugula. Also add the lemon or lime juice and zest. 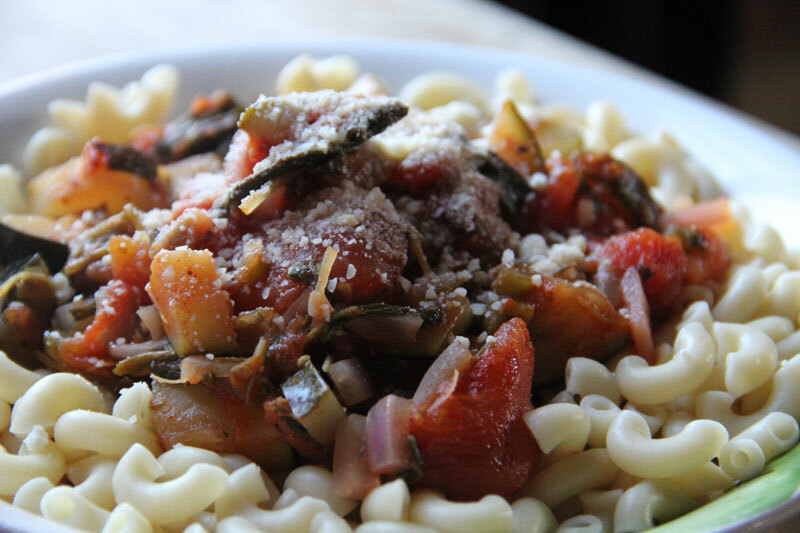 While your vegetables are simmering, you can get your macaroni going. Fill another medium to large pot 3/4 full with water and bring it to a boil on high heat. Add a bit of salt (about 1/2 teaspoon) to the water. When the water is boiling, turn down the heat to low and add the macaroni. Make sure to key an eye on the macaroni so it doesn’t boil over – stir it occasionally so the pasta doesn’t stick. When the pasta is done, drain it and set it aside. I like my pasta el dente, and the way I know is ready is that when I break off a small piece off of a macaroni (or any other pasta), there will be just a slight hint of white – I’ll cook it a few minutes more and it’s ready. When the pasta and the vegetables are both ready, plate the macaroni and spoon the sauce overtop with a sprinkling of either parmesan or romano cheese. This dish can be served either chilled or hot. This entry was posted in Mains, Vegetarian and tagged macaroni, pasta, tomato-based, vegetables. Bookmark the permalink.